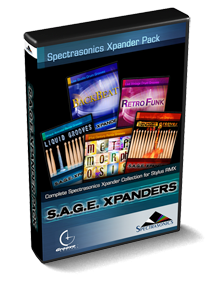 The SAGE Xpander Pack includes all FIVE of the Spectrasonics Xpanders for only $149 US. Every Stylus RMX user who doesn't already own these fantastic groove libraries will want to get this special package, as it represents an extraordinary value. The highly acclaimed grooves on these award-winning Xpanders were produced by Eric Persing and feature numerous top session drummers including Abe Laboriel Jr., Gregg Bissonette, Bob Wilson, Eric Boseman and John Ferraro. The wide range of tones and styles of the five Xpanders provide a versatile starting point for users to create authentic rhythm tracks. Owners of the original Stylus RMX should contact their local Spectrasonics dealer to purchase this exciting package. For musicians that have NOT purchased Stylus RMX yet, please request Stylus RMX Xpanded from your Spectrasonics authorized dealer, which already includes these same 5 SAGE Xpanders along with the RMX software. If you purchased Stylus RMX without the Xpanded bundle you can get all Xpanders as a single product for $150.